Good news for people who like magic carpets, magic lamps, and domesticated tigers. The live-action Aladdin movie is *officially* in production, and soon, we’ll all be transported to Agrabah and the the tale of a street rat who wins the heart of the princess — and also saves the city in the meantime. And frees Genie! The Aladdin cast includes: Two-time Oscar nominee Will Smith as the Genie who has the power to grant three wishes to whoever possesses his magic lamp; Mena Massoud as Aladdin, the hapless but lovable street rat who is smitten with the Sultan’s daughter; Naomi Scott as Princess Jasmine, the Sultan’s beautiful daughter who wants to have a say in how she lives her life; Marwan Kenzari as Jafar, an evil sorcerer who devises a nefarious plot to unseat the Sultan and rule Agrabah himself; Navid Negahban as the Sultan, the ruler of Agrabah who is eager to find a proper husband for his daughter, Jasmine; Nasim Pedrad as Dalia, Princess Jasmine’s hand maiden and confidante; Billy Magnussen as Prince Anders, a suitor from Skanland and potential husband for Princess Jasmine; and Numan Acar as Hakim, Jafar’s right-hand man and head of the palace guards." It appears as if Disney has cut Iago from the movie, and no, I will not stay calm about this. 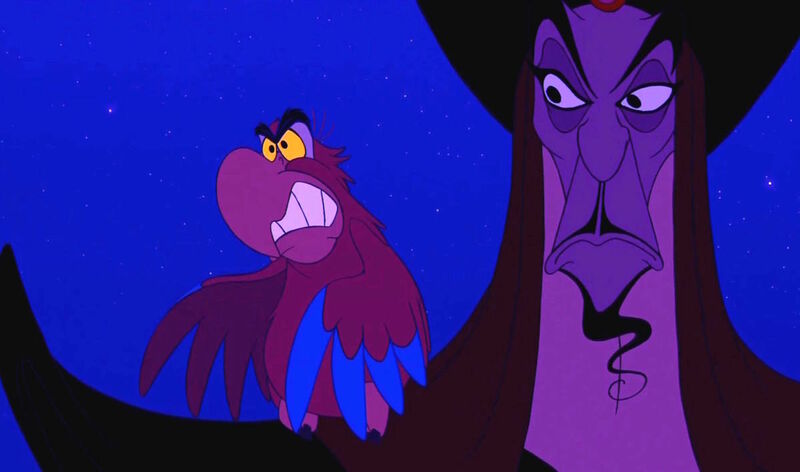 Iago is, in my humble opinion, the best character in Aladdin because he is a sassy AF parrot who has a hidden agenda of his own. How could you NOT love Iago? Well, it looks like the folks at Disney might not, as there is a parrot-sized hole in my heart right now. As far as I can tell — and yes, I have looked — there’s never been any mention of casting someone to voice Iago, who was played by Gilbert Gottfried in the OG version. Actually, when I googled “Iago Disney live action Aladdin” the first story that popped up was the last story I wrote about this issue, so it sure looks like I’m the only one campaigning for him to have some sort for speaking-role in the live-action reimagining. The same “where is he? ?” question can also be raised for Abu, Aladdin’s monkey. While cute and adorable, Abu doesn’t really have lines in the movie, aside from a few monkey squeaks, so it’s not like we need to sound the alarm over his lack of casting. More than likely, we’ll see Abu. But will we see Iago? With Aladdin now filming, that means there’s still a little bit of time to rectify this glaring omission. Give me, and the people, and the parrots of the world what they want. I-A-G-O.